GROZNY, Chechnya - There is still no complete clarity about the details of the assassination attempt on Sulim Yamadayev in Dubai on March 28. According to the Kommersant newspaper, the Hero of Russia was shot by a lone killer. Moskovsky Komsomolets claims that there were two attackers. It is already obvious that the Yamadayev case is an unusual one. The attack on the former intelligence colonel took place just as he was walking to his SUV parked in a parking lot at a housing complex. Other versions according to which he was on his way home or leaving it in order to go into town are not so important. The detail that gives us grounds for claiming that the assassination was unique of its kind is the presence of Yamadayev’s bodyguards. In order to get at their victim the killer or killers had to take on either one or two of those guards. Why does this fact make the situation unique? It suggests that the killers had a special motivation. Clearly, an obstacle in the form of bodyguards who have to be overcome in order to reach the assassination target a) greatly reduces the chances of success for the whole operation and b) puts the killer himself in a vulnerable position. There is a considerable likelihood of him being killed or arrested. While it is, of course, too early to make definitive conclusions, it looks as though an the assassin or assassins who were willing to expose themselves to risks of this kind could not be ordinary mercenaries, who usually try to exclude unpredictability factor from their work. The entire event is reminiscent less of an assassination than of a battle, and this means that the attackers must have had personal motives. As a matter of fact, yet another assumption could be made: the perpetrators may have been motivated by a very large monetary or other reward. But in any case, the sequence of events seems highly unusual. Who stands to benefit, and who is to blame? These are the questions that are destined to become the leitmotif of all publications about the assassination. The main theory, the one that lies on the surface, has already been given an airing. 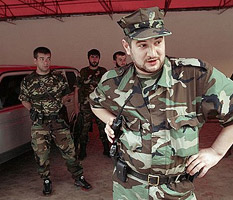 Without identifying him by name, Sulim’s younger brother Isa has pointed the finger at Ramzan Kadyrov as the person who may have ordered the killing. Isa says that Sulim “stuck in Kadyrov’s throat”. Some time ago Isa also gave the media what he said was a hit-list drawn up by Kadyrov’s special services, on which Sulim Yamadayev’s name was number two. Nor should one lose sight of the fact that the former Vostok battalion commander moved to Dubai because he feared an attempt on his life which would, he believed, be organized by Kadyrov’s men. Less obvious theories also deserve attention. Fighters of the Vostok battalion have been accused of committing a large number of murders. “Blood-feuders” might have launched a hunt for the man they believed responsible for the killing of their relatives, taking advantage of the fact that Yamadayev, finding himself in the position of a hounded victim, lacked proper personal protection. However, if this were so one would have to assume that the blood-feuders were very wealthy indeed, and able to bear the very considerable expense required to organize such an attack. Yet another theory has been advanced, one which for all its exoticism seems quite plausible. The avengers could have come from neighbouring Saudi Arabia. The well-known Arab field commander Abu al-Walid, who fought on the side of the Chechen guerrillas and died at the hands of Vostok battalion fighters, was a citizen of that country.